Are you used to smiling with your mouth closed because your teeth are unsightly? And when you laugh... you have to remember to quickly cover your mouth? Colgate has introduced a new line of products that promises to give users whiter teeth after just one week! The new Colgate Optic White helps you get teeth one shade whiter after just one week of continued & regular usage! I told my friends (some of whom smoke) about these new products & they were super excited to try it! I am not a smoker but I've never really had very white teeth :( I think I just wasn't born with a set of white teeth, but I drank a lot of Coca-Cola & Lipton Tea growing up & the caffeine in those certainly didn't help! So I was really keen to try the new Colgate Optic White products! The toothbrush in particular really looks promising! I already believe it works just because it looks so high-tech hahahahaha. 1) The Whitening Cups are designed to hold toothpaste more effectively for removing surface stains, helping to polish away stains & other debris on your teeth! 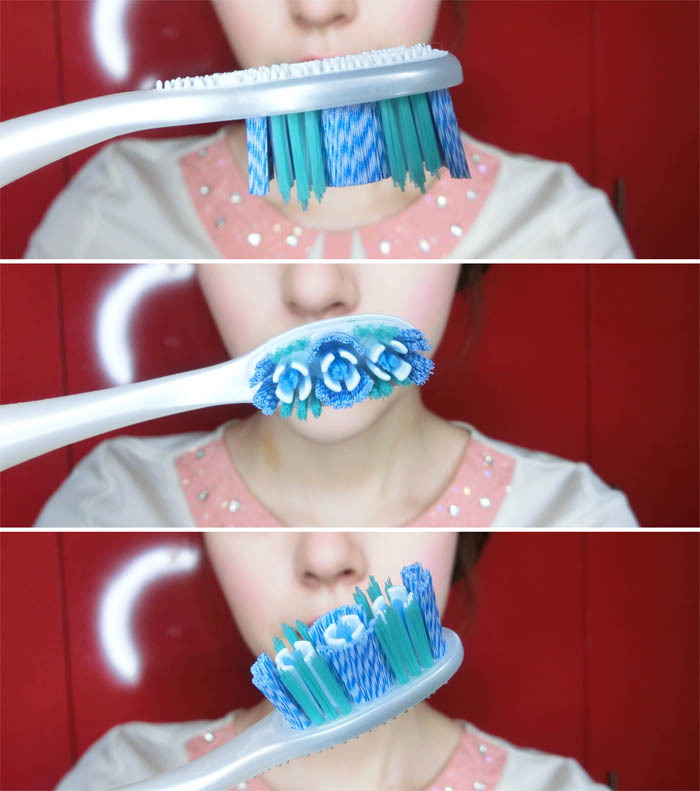 2) The Polishing Bristles help polish surface stains and hard-to-reach areas to ensure a full white smile! The toothpaste itself is where most of the magic works for them white teeth! The toothpaste contains Whitening Accelerators (silica & pyrophosphate) that exfoliate stains and polish teeth surface giving you one-shade-whiter teeth in just one week! Last but not least, minty fresh mouthwash that helps maintain the natural whiteness of your teeth! Don't subject other people on the morning rush hour transport to your bad breath! I also kind of like the taste of it & how my mouth feels super clean & fresh after that! Colgate Optic White toothpaste with its matching toothbrush for optimum effects! Make sure to get all the insides & corners! Feeling instantly clean & fresh! This is after using the Colgate Optic White products after a few days! When I use the toothpaste I can feel a slight freshness & tingling on my lip (since your teeth can't feel), which I can only assume is due to the Whitening Accelerators working their magic! I had my friends try it as well & they too noted the same sensations! I don't know about you, but most people tell me I look better smiling with teeth. And it's true that nothing beats a big, cheery smile! While makeup & clothes can change your look, it's impossible to conceal unsightly & discoloured teeth that can instantly make or break your smile! Get ready to flash them white(r) teeth! I am going to say bye-bye to 22 years of mediocrely off-white teeth :D Be gone! Prior to the commercial release of Colgate Optic White I was also a part of the official launch at Ion! I was dressed up in a pretty red gown for the occasion! Here you see me with my mouth closed LOL. Not so cheery aye? 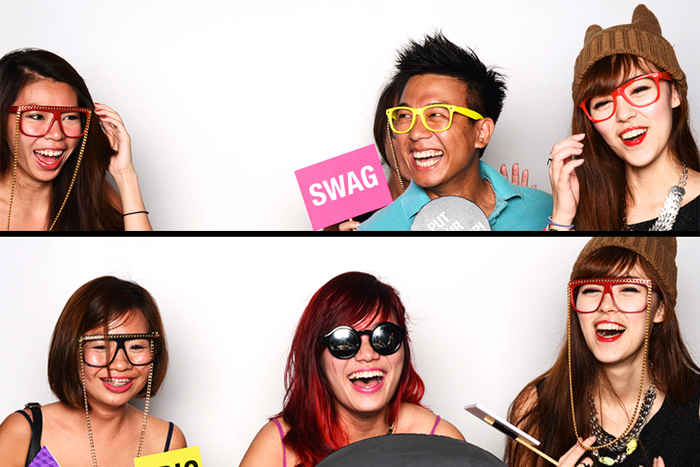 Luckily that day I was also joined by two other bloggers, Beatrice & Melissa so we entertained each other & snapped a lot of pictures at the Colgate Optic White photobooth wall! Our part that day was basically to be involved in a catwalk as part of the official countdown & launch of Colgate Optic White, so we were all dressed in red & white & flashing big smiles! And here is the official launch being commemorated by Launched by Mr Alek Penbeyan, Commercial Manager of Colgate-Palmolive Singapore & Nor Aziah Mohd Said, Senior Marketing Manager of Colgate-Palmolive Malaysia, Singapore, Brunei! And ta-dah! Colgate Optic White was officially launched. Which stage are your teeth at? Look at how much whiter it can become in just 7 days*! Hehehe me smiling with teeth! *When used as directed, for extrinsic stains only. Teeth whitening results may vary individually. 11 comments on "Colgate Optic White"
The dress look good on you! Omg ur so stunning!! Wtf! Hahaha i even rubbed my eyes when i saw u with the red dress! Self esteem dropped! Aiyo! Did you lose weight, look like you have a smaller frame. Where did you get the red dress from? Lovely! Was provided by Colgate! I think they had the dresses made. I like it too! :D Wish I could keep it haha. Looks effective. Guess this will be the next on my buying list. Colgate has been doing well so far. You make no sense at all. This blogpost is clearly a sponsored advertorial but that doesn't mean the product doesn't work. Looks great! I am also using Crest Pro-Health Whitening toothpaste like this one. It's very effective. Thanks for sharing with us.